JANM’s 2017 summer interns spending time in Little Tokyo. L to R: Mia Kato, Karina Kawana, Leighton Okada, and Ridge Hirano. Mia Kato interned this past summer with JANM’s facility maintenance and rentals department. She offers the following account of her experience. When I first started interning at the Japanese American National Museum, I thought I would be doing such typical intern tasks as getting coffee, making photocopies, and stapling documents together. Little did I know that my summer was going to be filled with different tasks every day—from designing a website to tasting sushi at a hotel. I was pretty nervous in the beginning. Learning where everything was and how to use it was very overwhelming at first. Not to mention, remembering everyone’s names was a challenge—thank goodness for name cards! When I was presented with a desk in the facilities office and a building access badge, I felt official. Having sat in classrooms all of my life, the work setting felt a lot different to me. I felt like a real grownup for once and it was great. Over the last couple of months at JANM I learned a lot. I initially came here because I needed to complete a 400-hour course credit requirement for school. As I put in these hours however, I was exposed to many different aspects of museum operations, including visitor services, public programs, and facility maintenance and rentals. These different departments taught me a lot of things and I am so thankful for the people who took me under their wing. In visitor services, I experienced what it was like to be the first person to represent the museum. To be able to answer the numerous questions that always came in, I had to expand my knowledge about the museum, Japanese American history, and Little Tokyo. Being in the front of the museum also brought me closer to the visitors that came in, because I got to learn their stories and their personal connections to Japanese American history. When I worked in public programs, I was amazed to learn how many little details go into each event. I learned to think outside of the box and to look at not only the bigger picture but the smaller details. This department helped me understand a lot more about my hospitality administration major and everything that it takes to organize an event. Facility maintenance and rentals was the primary department that I was assigned to. At first, I was a little wary about being in this department because I did not know what kind of work it would entail. To my surprise, this was not your average 9-5 job; every day was a different adventure. My supervisors were amazing and always included me in the various activities that went on throughout the day. I was able to go on walkthroughs, join food vendor tastings, and even climbed to the roof of the building at one point. Together, our department worked on marketing and advertising facility rentals for the museum. We worked on a new website, a brochure, and a rentals packet. They taught me the process of organizing event rentals, which requires a lot of paperwork and attention to detail. I also got to work on my correspondence and communication skills. Overall, I had a wonderful experience at JANM. I came in very hesitant and nervous, but I am leaving with new skills and experiences that I never in my life thought would happen. Each department taught me something a little different that I will be able to apply to my studies at school and in the future, at work. I appreciate everything that I got to do this summer through JANM and I hope that the next group of interns will have as much fun as I did. Mia Kato is studying hospitality administration at Boston University. Applications for the Getty Multicultural Undergraduate Summer Internships at the Japanese American National Museum are due on April 27! If you are considering applying, read on for one former intern’s story of how the experience changed her life. 2011 Getty interns Yuiko Sugino, Alexa Kim, and Alyctra Matsushita, in front of a wall drawing by Stan Sakai. What sounds like the beginning of a bad joke was my college reality. Living in a house of Humanities and Social Science majors, my roommates and I spent four years worrying not just about term papers and printer cards, but also about student loans and postgraduate careers. As optimistic freshmen, we joked that upon graduation we would all live in cardboard box mansions, as that would be all we could afford. But as graduation loomed nearer, we said it more frequently through gritted teeth. Then, in my junior year I learned about the Getty Multicultural Undergraduate Internship, available at the Japanese American National Museum as well as numerous other museums throughout Southern California. It sounded promising on all counts. I was attending UC Santa Barbara, and returning to Los Angeles for a cool internship sounded much better than the alternative of slopping meals at my student job in the campus dining commons. I also liked the idea of putting “Getty Intern” in big, bold letters on a résumé that boasted little more than my previously mentioned cafeteria duties. And perhaps most important of all, it was PAID! After eagerly filling out the application, getting my letters of recommendation, and sacrificing a lamb or two, I learned that I was chosen to be JANM’s 2011 Media Arts Intern. Although excited, I was also a little wary and hoped I wouldn’t be a glorified coffee runner, coming home with fingers bloodied by paper cuts and blackened from fixing toner cartridge jams. But I figured at the very least, I’d have ten weeks in Little Tokyo surrounded by all the mochi ice cream I could get my hands on. I can still remember my first day, five years ago. I was immediately introduced to the two other Getty interns, who were assigned to the curatorial and production departments. We all squished together on a pale leather sofa in a bright room called the Takei Lounge, nervously awaiting further instructions and making awkward small talk. Then, after a quick orientation, we dove into our jobs as museum interns. and Krista Chavez. Photo courtesy of discovernikkei.org. As cliché as it sounds, the ten weeks in Media Arts flew by as I learned many new skills. I spent Saturdays filming public programs, meeting speakers that included baseball players and sports executives, hearing poetry readings, and learning the history of kamaboko (fish cake)—with samples! I got a VIP invitation to the Japanese Consul General’s home. I was suddenly able to grab a camera, shoot some videotape, and use Final Cut Pro to edit my own film. I learned basic Photoshop, and could create a real DVD with all the bells and whistles. Yet, as résumé-ready as these skills were, it was the experience and the interactions with people at the museum that were most life-changing. I met staff and volunteers who had passion for the same things that I had passion for—brilliant people who cared about Japanese American history and culture, who understood the beauty of books and the knowledge they held. I met academics whose texts I had studied. I met people who could (and had) designed exhibitions from the ground up. One of my fellow Getty interns learned about the mysteries that could be unearthed in a pile of artifacts with a pair of white gloves, while the other experimented with wall vinyls and paints, learning how to make research come to life. how to make kamaboko (Japanese fish cake) by hand. In those ten quick weeks, I gained a new skill set, a few extra pounds from all the mochi ice cream and snacks, and most importantly, the knowledge that there is a brick-and-mortar set of walls that houses (and pays!) people who care about the same things I care about. When I left, I still didn’t quite know what I wanted to do with my postgraduate life, but I had a much stronger idea of where I might like to be. In 2014, when I got a call from my amazing Media Arts supervisor about a temporary position in the museum store, I jumped at the opportunity to get my foot back in the door. Since then, I’ve managed to turn that temp gig into a full-time job, taking on a combination of Development, JANM Store, and Visitor Services duties. I’ve connected and reconnected with dozens of wonderful people, met the great George Takei (friend of the museum and the namesake of the lounge where I met my fellow interns back on that first day), and found a real home in this little JANM family. For details on the available internships and how to apply, visit our Jobs page. Growing up in Southern California as a person of Japanese descent, JANM has played a large role in helping me discover my cultural identity. Each exhibit that I have immersed myself in has, in one way or another, done an excellent job of captivating me while still teaching me about my Japanese American heritage. Out of all the exhibits that I have seen, the museum’s newest installment Visible & Invisible: A Hapa Japanese American History has been one of the most personally intriguing because it delves into the deep history of mixed-race and hapa individuals within the United States. Being half Japanese and half Caucasian myself, I found Visible & Invisible to be very relatable to my life. As I walked through the exhibit, a few pieces that really piqued my interest, including an anti-Japanese campaign poster for California Senator James D. Phelan that revealed the prejudice and discrimination Japanese Americans faced more than two decades before World War II. Another intriguing part of the exhibit was an article from Ebony magazine that highlighted the troubles endured by children of American soldiers and Japanese women. Although I can’t entirely relate to those children due to the fact that being hapa hasn’t been detrimental to me at all, I realize now that life for some mixed race children, both in Japan and in the United States following World War II, was not easy. Basketball has played a huge role in my life. Up until this past year I had been spending the majority of my weekends either at practices or games for my team, the Venice Lakers. Seeing the different Venice jerseys and pictures of multiple teams, a few of which I recognized, brought back many fond memories of my time playing Japanese American basketball. It was easily my favorite part of the exhibit. JA basketball helps expose children to not only the sport of basketball, but to different aspects of Japanese culture. If you ask a child of Japanese descent if he plays basketball, there’s a high likelihood that he or she will say yes, or will know somebody who does. Another facet of the exhibit that interested me was Virgil Westdale, a half Japanese, half Caucasian soldier forced to switch his name from Nishimura to Westdale so he could join the armed forces. After the United States Army Air Corps found out about Westdale’s background they demoted him to private, stripped him of his pilot’s license, and sent him to Camp Shelby in Mississippi to join the 442nd Regimental Combat Team. 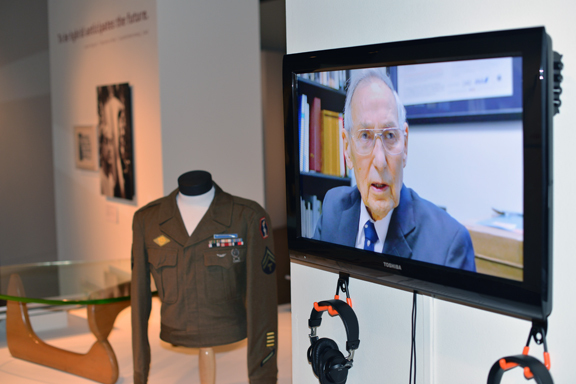 The accompanying video helped me delve deeper into Westdale’s personal account of what life was like for him as a mixed-race member of the 442nd and as an American of Japanese heritage during World War II. Lastly, this exhibit wouldn’t feel like a JANM exhibit without a compelling interactive component. I very much enjoyed the interactive aspects of last year’s XLAB 2012, however, the black journal experiment in Visible & Invisible has become my favorite, mainly because of the personal touch each participant can add. It’s absolutely amazing to see the artistic skills and personal messages from people as far north as Eugene, Oregon, to people who have lived in Boyle Heights since 1944. Ultimately I would have to say that the main reason that Visible & Invisible initially appealed to me was because I am mixed-race. However, walking through the exhibit I realized that the exhibit wasn’t so much about being hapa as it was about the Japanese American experience. Visible & Invisible runs the gamut in terms of Japanese and mixed race culture within the United States by giving an informative, yet enthralling, look at nearly 300 years of history. I highly recommend coming to the JANM to check this exhibit out before it ends on August 25th. Writer Jeremy Parks is a 17 year old high school senior who attends Campbell Hall High School in Studio City. He is an editor on his school’s newspaper. He is volunteering this summer with the museum’s Watase Media Arts Center. Sometimes, when I visit museums, the exhibits tend to lack substance and are most of the time, very similar. After walking through and reflecting on the material, I don’t feel like I’ve gained anything. It feels as if something is lacking. Xploration Lab 2012 (XLAB) fulfills every need and want in an exhibit and more. XLAB is an innovative museum experience where participants are fully immersed in each aspect of the display, and through their participation, aid in the creation of future engaging exhibitions for the Japanese American National Museum (JANM). XLAB’s main focus is to educate visitors on the importance of culture and identity, and how sometimes, those two concepts are one in the same. In modern America, the teenage demographic, while seemingly hard to understand, is actually not so much of an enigma as many people are led to believe. They are on the precipice of adulthood and are beginning to stray away from their normal routine to engage in new experiences. XLAB is the perfect exhibit for any teenager because the subject matter is broad enough to entice them, yet specific enough to be relatable. In addition, teenagers are trying to figure out who they are and that is essentially what XLAB is all about. The interactive aspect of this exhibit adds a whole new dimension to the clichéd museum experience and makes it more effective in delivering its message. As I walked into XLAB, I instantly realized that this exhibit would be unlike any other museum experience I had previously encountered. Since I’m a half Caucasian and half Japanese teenager, the first section that really caught my eye was What Are You? Each person who participated in Kip Fulbeck’s project had words to say that I could relate to as a teenager and as a person of multiple cultural backgrounds. Although the rest of the first room was wonderful and educational, the placement of My Voice is a Microphone made the activity somewhat easy to miss for people who weren’t paying attention to the layout. The next room contained a lot more interaction and each section had content that would attract teenagers. One of XLAB’s more popular portions is Ways to Tell if You’re Japanese American. Even though the list was written from a Southern California Sansei and Yonsei perspective, almost every local Japanese American teenager can relate to at least a few numbers on the list. A common high school student would certainly enjoy two of the last activities: Pidgin and Express Yourself. Pidgin is a dialect that is the unofficial language of Hawaii. XLAB has taken this idea and added modern internet slang such as LOL, FTW, and ROFL, which has made it much more relatable for teenagers, while still infusing the cultural Hawaiian roots into the activity. Express Yourself is another ingenious portion that focuses on how expression through what people wear is becoming more and more prominent. The section is composed of a large whiteboard where visitors could design their own shirts using dry erase markers, and magnets. Surrounding the white board are completed t-shirts that aid in the expression of ones culture and identity. The interaction involved in this activity helped make it one the most popular activities that XLAB had to offer. Each and every activity had a successful way of delivering the overall message of culture and identity. People of all ages would enjoy this exhibit because of everything it has to offer. The interaction of each activity sets XLAB apart from the plethora of boring and formulaic exhibits that most teenagers are accustomed to. In essence, this exhibit is not one to miss, and everyone should take some time out of his or her day to experience what XLAB has to offer, before it closes on August 26th. Writer Jeremy Parks, a summer intern at JANM, will be in 11th grade this coming fall at Campbell Hall High School located in Studio City. He will be a news editor on his school paper and is an offensive lineman on the football team. Hello! I just finished reading through all of the previous interns’ entries, and it seems like fun. I guess I’ll try to revive the intern section of the JANM blog! My name is Lawrence, and I’m transferring to Cal State University, Northridge, in the fall as an Asian American studies major. This summer, I’m one of eighteen interns who have been placed at a variety of different community-based organizations throughout California’s Japantowns (in Los Angeles, San Jose, and San Francisco) through the eight-week-long Nikkei Community Internship program. This summer, the program has placed me with both JANM and the Japanese American Bar Association (JABA), so while I’ll be contributing to the Discover Nikkei website in my capacity as the Discover Nikkei intern at JANM, but I’m also going to be researching and helping to preserve the legacy of pioneering Nikkei jurists in the local Los Angeles community for JABA! 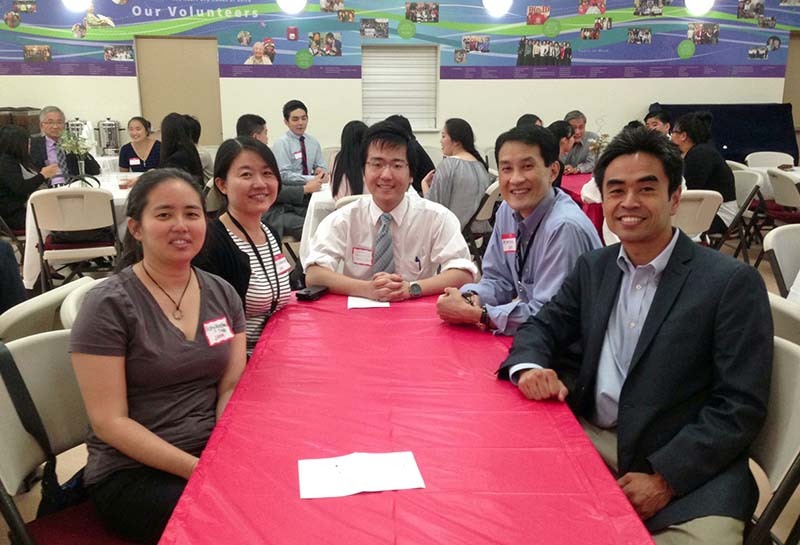 The first two days of last week was the opening retreat for the Nikkei Community Internship (NCI), and even in those first two days, I got a chance to see how close-knit and interconnected the Japanese American community in Little Tokyo — and even the larger JA community beyond it — is. It’s so amazing and refreshing to see so many people working for their community in very real ways. I’m sure that, as the summer proceeds, I’ll continue to be impressed at the family-ness of the community here. I’m just glad to be a part of it this summer. It’s only a week into my internship at JANM/JABA, and I’m really excited for the next seven weeks! Our volunteers are amazing. They continually inspire us with their dedication and enthusiasm. They are even willing to step outside their comfort zones if it means helping the museum to share the important stories of the Japanese American experience. Since last summer, staff at our Watase Media Arts Center along with interns and volunteers have been working on a series of digital shorts that record many of our docents and other volunteers. The videos share the volunteer’s personal stories related to artifacts from our core Common Ground: The Heart of Community exhibition. We’re collecting them together for easy access on our Discover Nikkei website. There are already 15 of the videos online, with more being added almost weekly. Volunteers featured so far: Bob Uragami, Babe Karasawa, Yae Aihara, Richard Murakami, Yoko Horimoto, Jim Tanaka, Tohru Isobe, Mas Yamashita, Robert Moriguchi, Kathryn Madara, Kent Hori, May Porter, Eileen Sakamoto, Lee Hayashi, and Roy Sakamoto. In true clichéd fashion, the last ten weeks have flown by. As I sit in the same desk, at the same borrowed computer, within the same borrowed space of the Frank H. Watase Media Arts Center wherein I wrote my very first blog post, I can’t believe how quickly this internship has come and gone. In ten short weeks, I learned the ins and outs of media art construction, from working a camcorder (make sure your input mics are working, your indoor/outdoor light settings are correct, and you remember to press record) to the sometimes tedious essentials of editing on Final Cut Pro (Cross-Dissolve-Copy is one of the transition favorites among the staff) to the joys of a finished DVD and the triumph involved in pressing the PLAY button. However, as my time as the 2011 Media Arts Intern comes to a close, I leave with my head held high. More valuable than the new skill set I’ve acquired and refined, I’m pleased with personal enlightenment I can take away. For years, I had resigned myself to the fact that if I wanted to devote my life to Japanese American history and the richness it holds, it would have to be a side hobby, hidden behind a steady, if less satisfying, “normal” job. My time at the Museum has shown me that one can find a career, and fulfillment exploring history, edifying others, and serving the community. It’s opened my eyes to the opportunities, and wonderful people available in the field. I’ve been amazed by not only the wealth of compassion, kindness, and friendship the Museum has surrounded me in, but also the validation in knowing that there are so many others that share my passion, and have managed to make a career of it. All in all, my short time at the Museum has been life changing. As I write my final blog posting for the summer, I just want to share my extreme appreciation and thankfulness. I loved every second here at the Museum, and know it will be an experience I’ll never forget. Thank you all, and enjoy the rest of your summer.